An overview of the current state of pretreatment technology is presented alongside the latest advances and innovative techniques in the pipeline. This article is a status review of the industry’s efforts to control membrane fouling, including the current standard approaches (briefly outlined) and new and emerging technology. These efforts fall in two categories: pretreatment steps and “in-device” — a loose term to denote that the technology is incorporated within the membrane media, element, machine, or system. This in-device category is further categorized into physical embodiments and operating process steps. Common examples for each of these are the so-called “fouling resistant” variants of commercial reverse osmosis (RO) membranes and the backflushing step now nearly universal for operating hollow fiber ultrafiltration and microfiltration systems (HF-UF/MF). Everyone reading this article probably understands that fouling of pressure-driven membranes is a constant and pervasive challenge. The biggest controversy on the concept is how to creatively label fouling as a membrane process issue, such as “fouling is the major shortcoming, processing hurdle, ever-present challenge, market-limiting factor, nemesis, albatross, curse, plague, or bane of membrane processing” (or perhaps the “opportunity” for techno-entrepreneurs?). This article does not explain why fouling is bad or the benefits of preventing, mitigating, or reversing it. There are now thousands of articles and papers to reference for that information. But how can the current situation of fouling mitigation be summarized, and what emerging fixes are in the pipeline? The old axiom that every system design situation is different because every feedstream and every user’s objectives are different is only partly true. Beyond the typical pretreatment steps, diminishing returns are quickly reached for investing in more fouling prevention, so most membrane systems installed today use a fairly standard pretreatment scheme, differentiated by a few major categories of “systems.” The following descriptions are generalizations and, as such, are simplifications. 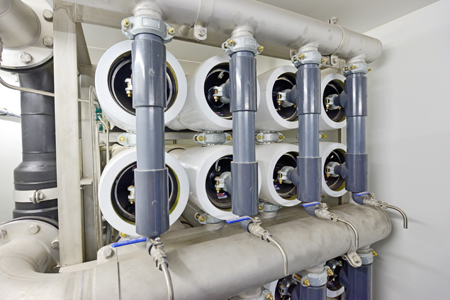 For POU (point of use) residential and small commercial systems, pretreatment typically includes a 5- or 10-micron prefilter and AC (activated carbon) filter to protect the polyamide membrane from chlorine attack. Both are disposable, like the membrane element itself, simplifying consistent operation and providing an ongoing revenue stream to component suppliers. A post-RO AC cartridge is not pretreatment but removes off-taste from the storage tank’s rubber bladder. In the more rare small POU UF system, there typically is no pretreatment. While larger commercial and light industrial systems may be installed in a business, they do not have trained operators assigned and typically use the same POU pretreatment scheme, sometimes adding a softener where hard water and/or a desire for high recovery (less water to drain) occur. Large commercial and industrial membrane systems usually justify maintenance by trained technicians and often use a backwashing particle filter (or, increasingly, the backflushing HF-UF/MF technology discussed later, which is more expensive but more efficient). Chemical feed of an oxidant (usually chlorine) is common to precipitate iron and manganese ahead of the filter. Chlorine and its siblings can also be fed to keep biological growth from occurring both in the pretreatment media and on the membrane surface, but this is actually not a common practice. Also common is feeding an antiscalant chemical to prevent precipitation of salts and silica. This pretreatment scheme has been popular for decades now. The most elaborate and most studied/published membrane pretreatment practices are in the municipal water treatment category. A century-old cohort of high-communicating professionals (i.e., noncompetitive) have shared their efforts to develop and adopt water treatment technology, aided by municipal, state, and (as of 1972) federal government support. When RO, UF, and then NF (nanofiltration) membranes became available, this group’s collaborative attitude about improving technology sped both its acceptance and refinement, including pretreatment. Further, they are experts in the pretreatment unit processes required, including oxidation-precipitation, coagulation/flocculation, backwashing bed filtration, dechlorination, etc., that define the standard pretreatment regimen today. Those not on the cutting edge of the technology or its use should look to this civil engineering pool to learn the best large-scale pretreatment techniques. This is not to imply that one should not analyze the feed and consider the best pretreatment scheme. However, once accomplished, the results often look the same. Also, some industries/applications do have other, more nuanced approaches. But they comprise a small minority of installed membranes. The “extraction industries” of oil, gas, and mining are areas of intense interest for membrane processing and have more difficult feedstreams. Thus, new and more elaborate pretreatment and in-device prevention techniques have been tested in this area. Due to competitive reasons, the system owners do not publish the test results, and their status is currently opaque in the marketplace. Pretreatment norms are also under development in water reuse/ reclaim, especially from municipal wastewater and extraction industries. Here, the value of the water reclaimed is growing, and the difficulty of fouling mitigation is higher due to a tougher foulants profile not yet addressed over past decades. Expect some advances to emerge, due to both the bigger technical hurdles and the market segment excitement that brings more funding and motivation. The biggest improvement in membrane fouling mitigation since the concept of crossflow operation is the backflushing of hollow fiber membranes. This was a game-changing benefit that, although two decades old, is still extending its reach. A periodic step, but applied continuously and frequently (typically every 15 to 30 minutes), it is a process operation like chemical addition or high-crossflow velocity. 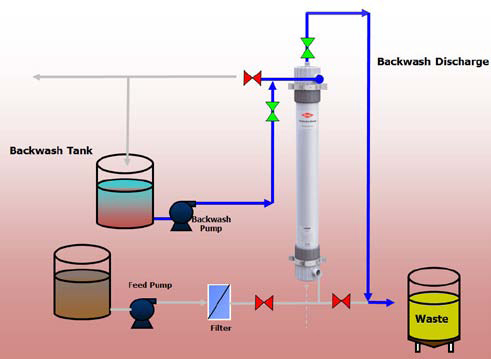 For applications where ultra- and microfiltration (UF/MF) provide adequate removal (think particles, colloids, and microbes), backflushing paved the way for economic operation in large-scale water purification plants as the final filtration. Its use as a pretreatment to RO and NF systems was immediately recognized, but its higher cost than backwashing bed filters limits its use. Seawater systems, usually larger and always more expensive, employ this method on 15 to 20 percent of new systems. Where fouling prevention is most crucial, such as for military operations, arid oilfields, mines, or shipboard purification systems, UF/MF’s better quality effluent is also often justified. But backflushing has proven difficult to apply to spiral-wound elements, so RO and NF membrane systems presently do not benefit from this technique. However, the fouling mitigation value alone makes hollow fiber RO/NF membranes a very attractive proposition. Should they be developed, they would be another step-change development and viewed as more of a holy grail than even the elusive chlorine-resistant RO/NF membrane. To gauge the effectiveness of pretreatment beyond the membrane fouling experienced, there are actually few common measures in use, especially for the most common uses of the purified water. These few measures are widely applied. For large systems with closely monitored operations (e.g., municipal potable water), there is turbidity to measure particle removal, and total organic carbon (TOC) as a broad gauge of organic foulants remaining after pretreatment. The next two techniques pertain only to the salt-rejecting membrane classes, RO and NF. Feedstream pH is monitored to keep salt from precipitating if it exceeds saturation while concentrated in the system, the tendency of which is pH-dependent. 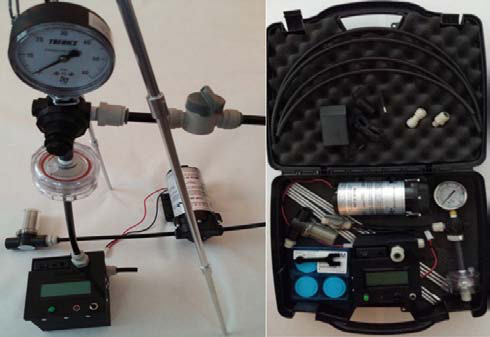 The measure most directly related to fouling potential of water, a direct indicator of pretreatment effectiveness, is the Silt Density Index or SDI test. This direct measure of fouling potential is decades old and used widely across the membrane marketplace for the RO and NF membrane class systems. It is an established warranty requirement for membrane elements, meaning that short membrane life due to fouling will not be an honored claim without proof that SDI values lower than the vendor’s benchmark have been maintained. Although limited in which foulants it indicates and its repeatability, the SDI test is the most accepted measure of pretreatment effectiveness and has been long codified by the ASTM standards organization as Standard Method D4189. Although now in its seventh iteration, the method has not changed much and so has not improved much over its life. New and expanded methods are in development but still in very limited use. The benefits, history, and shortcomings of SDI could easily provide chapters in membrane books (and do). For example, an inherent shortcoming of SDI is that some foulants will pass through its 0.45 micron test membrane, run in the dead-end mode; meanwhile, all RO, NF, and some UF systems are run in crossflow mode. Limitations more easily addressed include variation in the membrane discs required, lack of user friendliness and repeatability, and lack of normalization software. These last shortcomings are being addressed by more sophisticated automated systems, the most useful of which come with normalization software (to standard conditions) and teaching documentation. The SDI test method is already complicated; attempts at improvement have complicated it further. New methods touted as improvements include the Modified Fouling Index (MFI) using either UF or NF class membranes, so-called MFI-UF and MFI-NF tests. 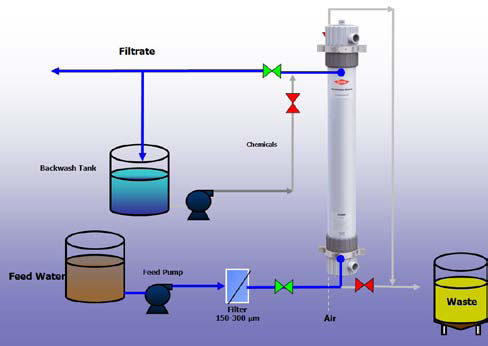 The more elaborate Crossflow Sampler — Modified Fouling Index Ultrafiltration (CFS-MFI-UF) test in theory is more predictive of real-world fouling. However, the SDI test is well-established in the marketplace, and change occurs slowly in the world of ASTM standards. The MFI and CSI-MFI-UF methods seem to have not yet broken out of the academic acceptance phase. So, besides improved SDI testing, what products and technologies are emerging to help reduce membrane fouling? The answer: Some in every category are coming; most are only incremental improvements, but a few could be step-change or even game-changers. Improvements in bed filtration (AKA “pressure filters” or “multimedia backwashable filters”) are incremental but continuous, with refinement of both the media used and processing steps. The same can be said of chemical feed treatment, mainly refined antiscalants targeting certain bad actors. These have proved themselves on silicates and are expanding to target other specific scaling solutes. Alternate chlorination chemistry (chloramines, chlorine dioxide, etc.) have been known for longer than membranes themselves, but their use is a slow-moving development. Other alternatives for bacterial fouling control, such as mixed oxidants and UV light improvement, can also be characterized as incremental. This same slow evolution characterizes verifiable antifouling membrane properties, although most RO/NF manufacturers label some products as FR or “fouling resistant.” Despite the best efforts of marketing departments, neither disciplined comparisons nor marketplace success has proven that these areas have produced real step-change breakthroughs in fouling mitigation. But some exciting changes are emerging now, too, and these are ones to watch closely. They include reduced-cost, backflushable ceramic MF membranes that might improve the economics of both large-scale final filtration but also could expand the use of backflushing HF-UF/MF for small and midsize system prefiltration. The recent entry of all PTFE (polytetrafluoroethylene) hollow fiber UF/MF membranes and modules also improves the selection of membrane that can be back-flushed and will allow harsher cleaning chemicals and higher sanitation temperature, improving economics in high-fouling applications. The established polymeric hollow fiber UF/MF suppliers are already looking at this small-scale market. The concept of ultrasound on a continuous basis, an example of induced energy disruption of fouling, has been known for some time. But now it is being actively developed by a startup company determined to overcome significant cost hurdles to create products that are economically justified and expected to be widely applied within the next five to 10 years. Another possible step-change is the very real and ready-to-test technology arena of nanofiber media. Development is well along on nanometer-scale, fibrous media technology with substantially reduced pressure drop at MF- and even UF-range separation. Making this more interesting is the ability to charge the media for select removal of some contaminants by sorption, while removing others by sieving while maintaining a low pressure drop. Products made with this media will be very useful at the POU level for membrane pretreatment (and final filtration as well). Depending on cost, both midsize and large systems could also benefit from such enhanced pretreatment, and if these can be made cleanable (by backflushing or otherwise), their cost will come down and acceptance will move way up. An “elegant” technical advance (the combination of efficiency and simplicity) to watch closely is mechanically imprinted nanoscale patterns in the membrane itself. These increase feedstream turbulence at the micron level and thereby reduce all categories of fouling. This technique has been proof-of-concept proven at the lab level, is under further development, and could be commercially available in a few years. Incorporated into the membrane itself, it does not require chemical modifications, which usually prove to be temporary; it would serve its anti-fouling function in every use and is an example of a potential game-changer. A four-decade technology developer and market builder in the membrane filtration industry, David Paulson has deep expertise in membrane application stemming from 20 years as director of corporate R&D for Osmonics/GE Water and nine years of consulting. Paulson has authored 40-plus papers in addition to peer reviews for the Journal of Membrane Science and the U.S. EPA. He contributes to AWWA, ASTM, and NSF International works and was chosen by the American Membrane Technology Association as a Membrane Pioneer. Currently, he is partner in the Water Think Tank, LLC, and Prime Membrane Partners, LLC.